Thanks once again to the British Embassy and Consulate staff in Brazil for all their help during my time here, and for inviting me along to their events in each of England’s host cities. 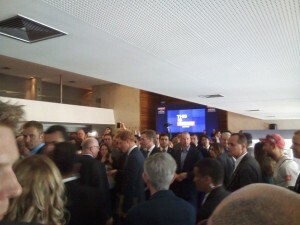 The third of these do’s in Belo Horizonte was a big deal, as this Telegraph article explains, with several VIP guests in attendance, but especially Prince Harry. 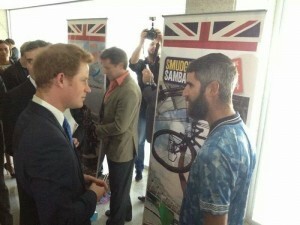 And I met him for a quick chat about the #SambaCycle! He also talked with Ride2Rio Hugh, the WTTWC lads and the organisers of the Street Child World Cup – all great British charity efforts in Brazil this year! As you can see from the pic above he’s well practised at these events and after saying hello and shaking hands he instantly adopted this listening pose, and I tried to briefly explain my adventure. He asked several questions, which was really nice to know he was interested and even seemed genuinely impressed, saying it was a “great achievement”! Top bloke, Harry for king! So now that the #SambaCycle has a royal seal of approval, please donate now, thanks.